These are just the SYMPTOMS of Leaky Gut Syndrome. LGS is NOT a Disease. It is a Primary CAUSE of Chronic Conditions. Food Elimination Diets and Pharmaceutical Drugs DO NOT TREAT Leaky Gut. If You Take ANY Type of Pain Medication or Have Taken Antibiotics in the Last 2 Years, Click to Learn Why Your Medications are Making Your Condition WORSE. Gastroenterologists consider it a very gray area, and because they don’t know enough about the gut, it’s difficult to diagnose. Medical schools don’t teach the concept of leaky gut, sometimes referred to as intestinal permeability. Patients suffer needlessly for years and eventually turn to alternative practitioners. BUT, you don’t need to go to a physician to see if you have LGS. Chances are, they’d prescribe a medication that would only make LGS worse! You Don’t Need a Prescription to Treat Leaky Gut Syndrome. Mother Nature Has Already Provided a Remedy. All mammals are born with a leaky gut on purpose. YOU were born with a leaky gut. A leaky gut ensures all lactating species will survive – through the transfer of immunity from mother to offspring. A mother's colostrum closes the holes that are naturally present in an infant's stomach and small intestine. So, if you weren't breastfed for a full 2 years, you have LGS now. Even if you were adequately breastfed, those lifestyle factors mentioned above have re-opened the holes. 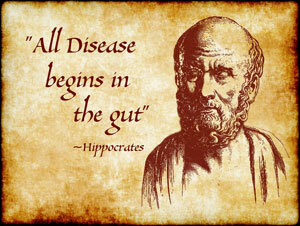 Leaky Gut Syndrome is the PRIMARY CAUSE of Chronic & Autoimmune Conditions. If you suffer from food or respiratory allergies or any number of autoimmune conditions, such as asthma, arthritis, autism, chronic fatigue, colitis, Crohn's disease diabetes, fibromyalgia, heart disease, IBS, lupus, multiple sclerosis, psoriasis, you have LEAKY GUT SYNDROME (LGS). LGS is the PRIMARY causal factor of all these conditions plus hundreds of others. Let us help you understand what LGS is, how it causes these conditions, and how taking bovine colostrum can halt and even reverse the progression of these chronic conditions. Hippocrates may not have known about Leaky Gut Syndrome, but he was definitely in the neighborhood when he said that "all disease begins in the gut." As People Age, They Develop Leaky Gut and Chronic Conditions. Unless You Treat LGS, You will Age Disproportionately Fast. The term Leaky Gut Syndrome, or leaky gut describes an increasingly pervasive health disorder in which the lining of the small intestine is more permeable than it should be and becomes inflamed by various irritants. The abnormally large spaces allow entry of toxic material into the bloodstream that would, in healthier circumstances, be repelled and eliminated. The gut becomes "leaky" in the sense that bacteria, viruses, fungi, parasites and their toxins, undigested food particles, and waste products pass through a damaged, porous, or "leaky gut." You can think of Leaky Gut Syndrome as a mixing of your body's "brown river" (digestive contents, feces) and your "red river" (the bloodstream). Your immune system sees these substances that pass through the gut wall as foreign substances, and it quickly goes into reaction mode and begins creating antibodies to neutralize the foreign invaders. The immune system is really efficient at doing this, but there's a hitch. Ongoing leakage of foreign substances puts the immune system in overdrive. 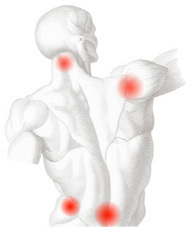 Chronic over-stimulation of the immune system leads to chronic inflammation and chronic conditions. There's a tipping point at which the body cannot recover from this chronic inflammation. Essentially, the body begins attacking itself, and this is called autoimmunity. The specific type of autoimmune conditoin that develops depends on the where the inflammation occurs. In a healthy person, the immune system consists of a complex set of mechanisms, with opposing characteristics (up-regulation and down-regulation) that keeps a balance when no autoimmunity is present. When the immune response is disproportionately strong, inflammation and cellular, tissue, and organ damage occur. Any condition that results from such an abnormal immune response is called an autoimmune condition. Food and respiratory allergies are also considered autoimmune conditions. After taking Colostrum LD® for two years, I no longer spend my days in bed with constant pain from fibromyalgia. I'm able to maintain my home, work part-time after completing my degree, and enjoy spending time with my 18-month old daughter. I don't know how or why colostrum works, but I do know that my quality of life has increased 100%. Stopping the crossover of undigested food particles and toxins into the bloodstream is critical to balancing an otherwise "hyped-up" immune system. Not only does a hyped-up immune system create inflammation, but it's so busy working against leakage from the intestines that it can't devote resources to other acute health problems, such as cuts, abrasions, trauma, wounds and other infections. Essentially, our body's defenses become spread too thin, and we recover very slowly or sometimes, not at all. So, how did you get Leaky Gut Syndrome in the first place? The last time you got a round of antibiotics for an infection or took pain meds for that back injury, you unwittingly caused more damage and put yourself into the vicious cycle of Leaky Gut Syndrome. If you're one of the more than 100 million Americans who regularly take OTC or prescription pain medications you're in the majority -- the majority who have LGS and one or more chronic conditions. The pain you hoped to get rid of is actually causing you MORE pain! Pain medications mask pain, but continue to damage GI tissue, thereby exacerbating LGS. When undigested food particles and toxins cross the intestinal barrier and get into the bloodstream, the immune system calls in the troops (antibodies) for a full attack. Eventually the immune system becomes overrun, and the body starts attacking its very own tissues (not just the undigested food particles and toxins). The pain of arthritis increases as more joint tissue is destroyed, and because doctors don't understand LGS, they continue to prescribe more pain medications. It's a vicious cycle, for certain! Then, add gut bacteria to the mix and the immune system goes berzerk. In a person without LGS, the bacteria normally present in the gut REMAIN in the gut, but someone who has a leaky gut, the bacteria can enter the bloodstream. These bacteria can travel to the heart and cause inflammation and infection leading to heart disease and stroke. If you've ever looked at the warning label on a package of ibuprofen, you'll notice that it says, "Long term continuous use may increase the risk of heart attack or stroke." It also says you shouldn't take it for longer than 10 days. Of course, it doesn't explain WHY. Oral antibiotics have two harmful effects. First, they can irritate the gut lining and second, they can foster the creation of "superbugs." Antibiotics kill both good and bad bacteria, but often the antibiotic-resistant strains remain in the gut, grow stronger and multiply. They produce toxins which can enter the bloodstream through a permeable gut lining and begin poisoning the body. Unfortunately, most people believe that (1) if a medication is sold over the counter, it's safe and (2) if a doctor prescribes a medication, it's safe. Not necessarily so! If Your Doctor Hasn’t Heard of Leaky Gut Syndrome or Colostrum, YOU May Have to Educate Them. Are there any other gut irritants that contribute to Leaky Gut Syndrome? Healing Leaky Gut Syndrome halts the progression of allergies and autoimmune conditoins, and there is only one clinically proven substance that will heal a leaky gut. That substance is bovine (cow) colostrum. Similar to a human mother’s colostrum that closes her newborn’s gut lining within a few days after birth, bovine colostrum does the same for adults. If you want your immune system to stop attacking your body, bovine colostrum is essential. Of course, you ALSO have to stop the stop the pain meds and antibiotics which are causing Leaky Gut Syndrome and, whenever possible, avoid substances that cause gut irritation. Once the lining of the small intestine is no longer permeable, the second step is to rebalance the body's immune system. Years or even decades of Leaky Gut Syndrome and an equal number of years of inflammation takes a toll on the immune system. Whether it's still hyped-up or nearly burnt-out, we need colostrum to return it to a state of balance (homeostasis). The Proline-Rich Polypeptides (PRPs) in colostrum balance the immune system by helping to regulate the thymus gland and either stimulate or suppress immune system activity. If the immune system is still hyped-up, the anti-inflammatory PRP-3s tone down the immune response. If the immune system is lagging, the antimicrobial PRP-2s boost the immune response. This rebalancing allows the immune system to be healthy and perform its normal functions of protecting us from pathogens. Now that you understand the rationale behind taking bovine colostrum, don't ruin your chances for healing by purchasing just any colostrum. Health food stores sell many products, but even the most expensive brand won't give you the results you need. And bargain brands often don't contain any or enough of the active components. In order for colostrum to be effective, it must contain high levels the active components, and it must be able to reach the cells with no compromise in bioactivity. A phospholipid coating, such as Liposomal Delivery, protects the colostrum from digestion and ensures it can deliver results at the cellular level. Raw, fresh colostrum has a liposomal surrounding of the active, sensitive molecules and so, we know that this is critical for processed supplements. Only one processing plant in the world has been designed to process colostrum in a way that maintains integrity of the active components and verifies bioactivity prior to distribution to consumers. If a colostrum supplement can't heal Leaky Gut Syndrome, it's no better than powdered milk. Colostrum is not digested (digestion destroys colostrum's bioactivity). Colostrum components are delivered through the bowel wall into the bloodstream to reach all organs and cells where needed. Transport through the cell wall to assist in RNA and DNA repair, stem cell initiation and differentiation; facilitate cellular growth, repair, and prevention of infection; and identify damaged and diseased cells. So what happens if you stop taking colostrum? If you stop taking colostrum, Leaky Gut Syndrome will return and the immune system will return to a state of imbalance. Some of the causes of Leaky Gut Syndrome are within your control, such as not using pain medications for extended periods of time or insisting your doctor give you antibiotics when you don't need them. Yet, there are other factors for which we have little or no control over. Antibiotics are turning up in the food and water supply as well. Cows, pigs, and chickens are routinely fed antibiotics even when they're healthy, and so we end up consuming the same antibiotics that were fed to livestock. Manure from these same livestock operations is poured out onto crops and gets washed into the water supply. There's even new research that suggests that genetically modified foods, especially corn, damages the gastrointestinal tract lining. The toxin that kills insects by making holes in the insects' guts does exactly the same thing to humans when they eat it corn or corn oil. Even an "organic" food can be contaminated with antibiotics. Our best defense is colostrum. "An eleven year old patient with severe juvenile rheumatoid arthritis did not improve with conventional pharmaceutical treatments. Three weeks after I placed her on Colostrum LD®, the pain and swelling in her joints had all but disappeared, and she no longer required braces on her lower legs. 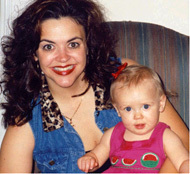 She continues to take Colostrum LD® and has not had any relapse of symptoms." Is colostrum safe for people of all ages to take? Definitely! Colostrum is safe and effective for people of all ages. Mammalian colostrum is not species specific. The active substances in bovine colostrum are identical to what human mothers produce for their newborns. Bovine colostrum is relatively plentiful and easy to source due to a prolific dairy industry. And no need to worry about baby calves. They're well taken care of before any colostrum goes for human consumption. Naturopaths and alternative medicine practitioners have recommended colostrum for decades. "Traditional" practitioners have been slowly coming around as they learn more about colostrum's benefits and review the clinical research. 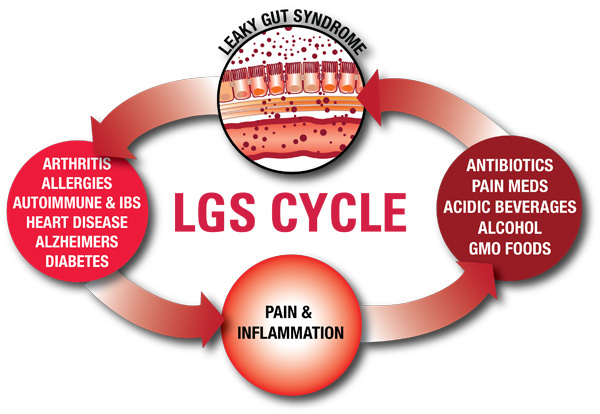 As physicians come to understand that Leaky Gut Syndrome is the cause of most chronic conditions and that the pervasive use of antibiotics and pain medications causes LGS, they will undoubtedly seek out a proven treatment for LGS. Colostrum LD® is the only all-natural, clinically proven substance to heal and prevent LGS. Colostrum LD® is the only laboratory-certified colostrum supplement to contain the growth factors clinically proven to heal & prevent LGS. Colostrum LD Capsules: 4 bottles, $159.80 + 1 free! If you order two or more bottles now through this special offer, we’ll send you a free copy of Leaky Gut Syndrome: A Modern Epidemic with an Ancient Solution? by Douglas A. Wyatt of the Center for Nutritional Research as it appeared in the June 2014 Townsend Letter, the nations leading complimentary care medical Journal (a $45.00 value). These statements have not been reviewed or evaluated by the Food and Drug Administration. The information provided is not intended to diagnose, treat or prevent any disease.